LOS ANGELES, Sept. 19, 2017 – Tennis Channel will be the exclusive television home for this weekend’s Laver Cup, the newly created tournament that pits six of the top European men’s stars against six of the top players from the rest of the world. The network will carry the entire three-day event live beginning on Friday, Sept. 22, at 7 a.m. ET. Team Europe, captained by Hall of Famer Bjorn Borg, and Team World, captained by his on-court rival and fellow Hall of Famer John McEnroe, will face off over three days for the initial Laver Cup. The event is named after Hall of Famer Rod Laver, whom many consider the greatest of all-time. Laver is the only player to win the calendar slam, all four Grand Slams within a calendar year, twice. This year’s event will be played at the O Arena in Prague, with future locations alternating between Europe and the rest of the world. The 2018 Laver Cup will take place in the United States. Through both singles and doubles matches the two teams will play to reach 13 total points. Each match win is worth one point on Friday, two points on Saturday and three points on Sunday. Every player must play in at least one singles match over the weekend but no more than two. Also, four of the six players must compete in a doubles match, with no repeat pairings unless there is a need for a doubles decider match on the final day if both teams are tied at 12 points. Each Laver Cup match will be best-of-three sets with ad scoring, and a 10-point tiebreak in the third set. There will be four matches each day, three singles and a doubles match. Team Europe will feature the two greatest Grand Slam champions in men’s tennis history with World No. 1 and reigning US Open champion Rafael Nadal and World No. 2 Roger Federer. In 2017 the pair swept the four Grand Slam titles: Nadal winning the French Open and US Open; Federer winning the Australian Open and Wimbledon. Fans will likely see them playing as partners in doubles during the event for the first time in their historic rivalry. 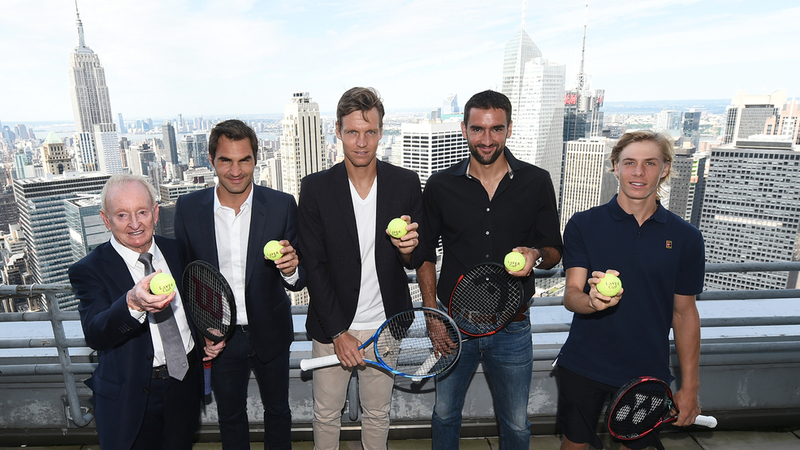 Rounding out the roster is 2014 US Open champion Marin Cilic, Alexander Zverev, Dominic Thiem and Tomas Berdych. Team World also features a Grand Slam champion in 2009 US Open winner Juan Martin del Potro. Americans John Isner, Jack Sock and 2017 US Open quarterfinalist Sam Querrey as well as Nick Kyrgios and Denis Shapovalov will complete the world team. This year marks the first year in a multi-year rights agreement between Tennis Channel and the Laver Cup. Veteran broadcasters Steve Weissman (@Steve_Weissman) and Leif Shiras (@LShirock) will call the matches with Grand Slam-winning coach Paul Annacone (@paul_annacone) and former player Justin Gimelstob (@justingimelstob) providing analysis. The Laver Cup is a joint initiative between TRIDENT8, Tennis Australia, the USTA and Jorge Paulo Lemann. Sinclair is one of the largest and most diversified television broadcasting companies in the country. Pro forma for the Tribune acquisition (before any related divestitures), the Company will own, operate and/or provide services to 233 television stations in 108 markets. The Company has multiple emerging networks as well as being affiliated with all the major networks. Sinclair is a leading local news provider in the country and a producer of live sports content. Sinclair’s content is delivered via multiple-platforms, including over-the-air, multi-channel video program distributors, and digital platforms. The Company regularly uses its website as a key source of Company information which can be accessed at www.sbgi.net.